How to Calculate How Much Roofing Felt Is Needed? Roofing felt, commonly called tar paper, is an important component of any roofing system. Using a roll of felt coverage (or several rolls) provides the roof with additional waterproofing and protects the wood sheathing of a roof until the installation of shingles is finished. Building codes and shingle manufacturers also typically require the use of roofing felt. The lifetime and flammability guarantees of roofing systems require the use of roofing felt prior to shingle installation. 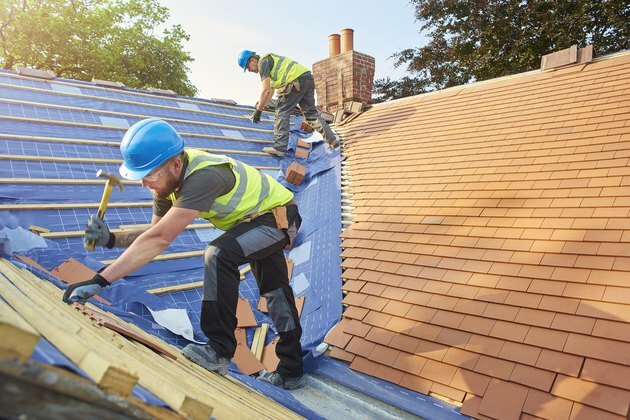 Roofing felt is rated based on the weight of a 100-square-foot section, with 15 and 30-pound felt being the most common. Before laying down the roof pitch, the space it will cover, otherwise known as the roofing square, needs to be measured. Enter the attic of the home, or any part where the roof framing is visible. Measure and mark a 12-foot distance along the floor in the same direction as the pitch of the roof. After that, measure the height of the roof above the floor at each end of the 12-foot distance. Subtract the lower height measurement from the larger height measurement. The difference calculated is the roof pitch. Typically roof pitch is expressed as a change in elevation per 12-foot distance. If your difference calculated in step four was three feet, your roof pitch is 3/12. Using the roofing calculator is important since knowing what the roofing square is on a roof lets you know how much roll of felt coverage to use, or if you'll need to buy more. Measure the length and width of the structure at ground level in feet. Multiply the measurements to determine the total area covered by the roof. If you have an irregularly shaped building, break the structure into several rectangles and measure each separately. Multiply the total area determined in step one by a correction factor to account for the roof pitch. This correction factor will take into account the greater area of the roof due to the pitch. If your roof pitch is 3/12 or 4/12, multiply by 1.25. For roof pitches of 5/12 to 7/12, use a factor of 1.3. Use 1.4 for up to a 9/12 pitch. For higher pitches, a factor of 1.5 to 1.7 can be used, although with less accuracy. Multiply the result in step two by 1.10 to account for waste. If the roof has complicated hips and valleys, add another 10 to 25 percent to account for the added area. Divide the result from step 3 by 100. Round up to convert square feet to squares. Roofing materials are always specified in squares. One square is equal to 100 square feet. Rolls of felt coverage for roofs is sold in rolls that are one square each. One roofing square equals to 100 square feet. Always double check with the roofing calculator to make sure that you have enough felt to cover the entire area of the roof.